This includes driverless cars and refrigerators that allow shoppers to check expiration dates of milk while they are away from home. Generally, consumers think of powerful technologies when they imagine the Internet of things. Traders have a tendency to do the same. They look at investing in driverless technology through expensive companies like Tesla. The electric car maker has a highly volatile stock that moves largely on pessimism and optimism about production of the cars. There will be a number of great technology products introduced in the next few years. There is no doubt about that. Tesla might even be on the list of companies that deliver these great products. There is doubt about that given the company’s history of production delays. It’s a great story that has become a legend. Business schools can shorten the story to the simple idea that “you can mine for gold or you can sell pickaxes and blue jeans.” History shows that in the Gold Rush many of the miners failed to find their fortune. But, some of the most successful business people were the ones who sold supplies to the miners, people like Levi Strauss who started making tents and eventually made a fortune selling denim pants. As has often been the case, glamorous jobs like gold mining have a lower return on investment than selling supplies to the workers who need basics to pursue their dreams. They didn’t mine for gold themselves but instead sold supplies to miners – wheelbarrows, tents, jeans, pickaxes etc. Mining for gold was the more glamorous path but actually turned out, in aggregate, to be a worse return on capital and labor than selling supplies. The stock is likely to fall into a short term trading range. 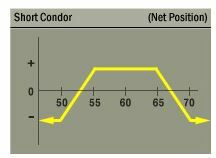 One options strategy that benefits from a stock in a trading range is an iron condor. This strategy has the added benefit of carrying limited risk. For the Internet of things, the pickaxes and blue jeans companies might be the chip makers. Traders seem be starting to come to this conclusion and are bidding up the stocks of companies that provide the components to the companies seeking fame and fortune. Traders interested solely in fortune could skip finding the next big thing and focus on companies like Seagate Technology PLC (NASDAQ: STX). Seagate is the world’s second largest chip maker. The company recently introduced the first hard disk drive (HDD) created specifically for artificial intelligence (AI) enabled video surveillance. The SkyHawk AI HDD, which is equipped with Seagate’s ImagePerfect AI firmware, will be marketed to the video surveillance market. It comes in two models, an 8TB model for a list price of $350 and a 10TB model which will sell for $450. The promise of new technologies has fueled a rally in Seagate’s stock price. The chip makers are coming out of a bear market that began as they were viewed as commodity providers, simply providing components for smart phones, tablets and servers. Now, the market for chips is expanding and even washers and dryers will require multiple chips to function in the future. This has led to sharp moves in the stock price of STX in recent weeks as traders react and overreact to each news story and earnings report. As earnings season winds down, the stock is likely to settle into a trading range. One options strategy that benefits from a stock in a trading range is an iron condor. This strategy has the added benefit of carrying limited risk. As you see, all of the options expire on the same day, Friday, December 15. Selling the options will generate $0.91 in income ($0.45 from the call and $0.46 from the put). Buying the options will cost $0.60 ($0.30 for the call and $0.30 for the put). This means opening the trade will result in a credit of $0.31, or $31 for each contract since each contract covers 100 shares. The maximum risk on the trade is equal to the difference in strike prices ($1.00) minus the premium received ($0.31). This is equal to $0.69, or $69 since each contract covers 100 shares. Most brokers will require a margin deposit equal to the amount of risk. That means this trade may require just $69 in capital. The maximum gain on the trade is the amount of premium received when the trade is opened. In this case, that is $0.31, or $31 per contract. The potential reward on the trade ($31) is 45% of the amount risked, a high potential return on investment for a trade that will be open for less than a month. If a trade like this is entered every month, a small trader could quickly increase the amount of capital in their trading account.